The Literacy Continuum is critical to your literacy instruction. It has everything you need to guide your students effectively through their literacy journeys. It’s right in the subtitle—A Tool for Assessment, Planning, and Teaching. This invaluable tool shows you where your students are, where they need to be, and how to get them there, all in one comprehensive, coherent document. It is often referred to as the road map to literacy acquisition in children over time, and here’s why. 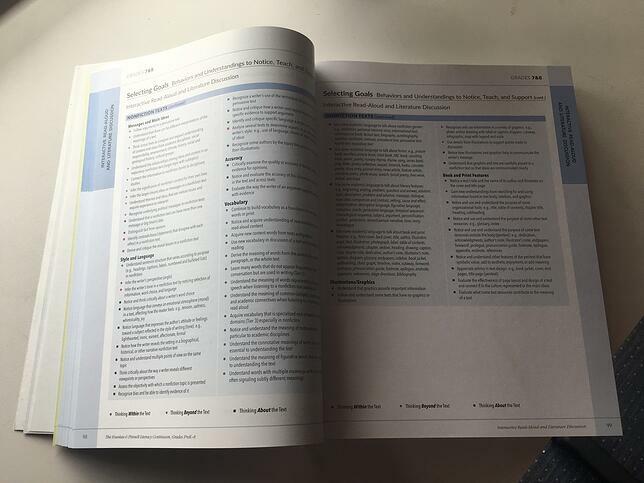 You can use The Literacy Continuum as the foundation for thinking about, planning for, and reflecting on your instruction in small-group, whole-group, and individual contexts. So if you are planning for guided reading, for example, you would refer to the list of behaviors and understandings listed under the appropriate level in the guided reading section/continuum to guide observations and interactions with individuals, and shape teaching decisions. You would do the same for interactive read-aloud, shared reading, writing, etc. When you and your colleagues teach for the same behaviors and understandings, your students will benefit from the coherence. 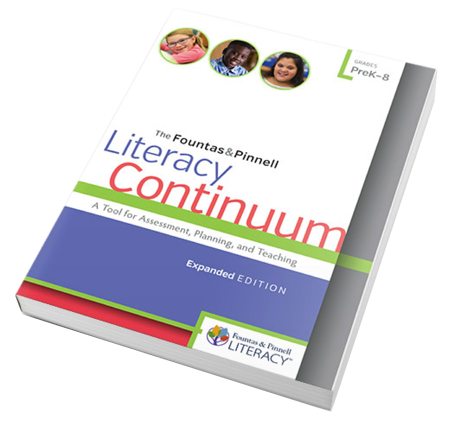 Use The Literacy Continuum to plan the literacy curriculum. It offers a starting point for thinking very specifically about the goals and expectations. It can be used by the grade-level team or the school staff and adapted to meet you own goals and district expectations. Sometimes assessment is administered and the results recorded, but then the process stops. If you’re unsure what to do with the data collected from the assessment, consider using The Literacy Continuum as a bridge between that data and the specific teaching that students need. With assessment, you learn what students know—the continuum will help you think about what they need to know next. Use The Literacy Continuum as a guide for evaluating student progress over time. You can evaluate whether or not students are meeting grade-level standards. Grade level is a term that encompasses a range of levels of understandings at any given time. Remember that no students would be expected to demonstrate every single competency to be considered on grade level. It is not recommended that you show The Literacy Continuum to parents in order to report on student progress. It is an overwhelming document. It would get in the way of good conversation. You can, however, use The Literacy Continuum as a resource for the kind of specific information you need to provide to parents, but shape it into easy-to-understand language. Many students will need extra support in order to achieve the school’s goals for learning. Assessment and observation will help you identify the specific areas in which students need help. Use the continuum to find the specific understandings that can guide intervention. Use this tool every day to guide your assessment, activate responsive teaching, and support your students on their literacy journeys.